Cake is one of my favorite things in the world. It's VERY hard for me to turn down a piece of cake, especially chocolate. Everyone knows chocolate is my weakness. I also love waffles for breakfast too. When I had the chance to review two foods that I really enjoy, of course I jumped on the offer. Everyone is aware of Duncan Hines and Aunt Jemima, they are two very successful companies. I received a free product coupon for any Aunt Jemima product. I went to the store yesterday and walked right over to the frozen food section. There were more AJ products then I realized. Did I want chocolate chip or blueberry waffles? French toast sticks? No, maybe I wanted plain pancakes...this decision was harder than I expected it to be. I finally settled on plain low-fat waffles. I had them for breakfast this morning. Frozen waffles are easy. Yes, it's always nicer to probably make your own waffles but when you have busy mornings like I do, it's nice to have something quick that you just pop in the toaster. I toasted the waffles just right and they came out crisp and hot. Paired with a little syrup, they were delicious. I also felt better about myself by making a low-fat food decision. Duncan Hines sent me some products from their newest line. I received a box of cake mix and a chocolate Amazing Glazes. The mix was triple chocolate. The box says "with real chocolate chunks and rich fudge." Ohhhhh WOW. Talk about triple deliciousness. The box has brown and reddish brown tones to it. The colors plus the amazing looking cake on the box draws you in and makes you want to purchase the mix. This mix is like any other mix where it requires water, eggs, and vegetable oil. There is a recipe on the bottom of the box for molten chocolate cupcakes that look extremely drool-worthy. This cake was out of this world. It was seriously the best cake I've ever made from a mix. It was fudgy, rich, creamy, and so delicious. I had a bite right out of the oven and it was practically a little piece of heaven on a fork! The other new cake flavors in this line are Caramel Apple and Carrot. Amazing Glazes comes in either vanilla or chocolate. I was sent chocolate for this one as well. I didn't even tell the person that I worked with on this review that I was a chocolate fan, they must have sensed it! The vanilla glaze that is also new in the DH line. This product is intended for the microwave. You microwave it on high for 35 seconds and then pour over your favorite pie, cake, brownie, cookie, or pastry. You have to be careful to not overheat it though. You can stick the bottle in the fridge and use it over and over too. The glaze will set in minutes. I am not sure how this is with ice cream though. I haven't tried it so I can't recommend it. I used this glaze on a large yellow cake I made for a party. It was very easy to pour and the glaze didn't come out too fast and was easy to control. It set within about a minute and a half. I let the glaze set and I later brought the cake to the party. Everyone loved the cake and complimented me on it. They asked the recipe for the glaze, I told them Duncan Hines! They were extremely surprised, they thought it had a great home-made taste to it. Yum, I can't wait to try the vanilla glaze in the future too! 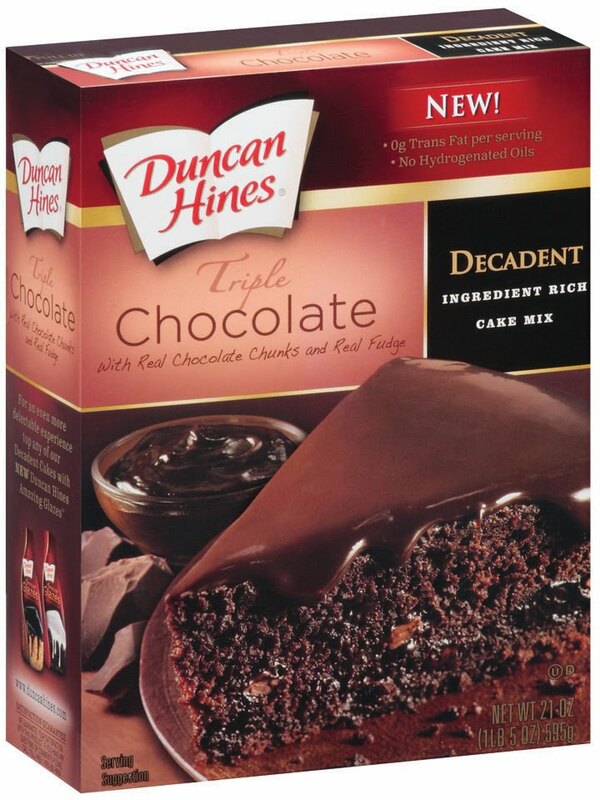 I will be picking ONE (1) winner to win a Duncan Hines Triple Chocolate Cake Mix+Chocolate Amazing Glazes. You will also win an Aunt Jemima free product coupon. Winner will be chosen on October 21, 2010 at 10 pm and then will be emailed. A special treat of a chocolate goodie would be wonderful. It would be a great treat to share with my family. I love trying new foods. OMG this looks soooo good. I would like to win because we have five people in our family and we go through a lot of food, and treats aren't always in our budget. I also like to bake more in the winter because it keeps me warm. I love chocolate! This would help me look like a pro baker. I would love to try the cake. It sounds so good. My son would love the waffles. I want to win this because that chocolate cake is calling my name, is all I can do to stop drooling! OMG it looks SO good and my son loves waffles and syrup! Hed eat them any time of the day! He's 19 and that is how boys his age eat! Anything anytime! i am a chocoholic and that is why I need these items. I would like to win because I like trying out new thinfs. I would like to win this because I'm hungry and I don't want to wait till thanksgiving before I get a chance at a cake like that! I'd like to win because I have a huge sweet tooth. OK. This has chocolate all over it, and for that reason alone, I would love to win it. as for me i would love to win this because i love chocolate cake, and this has my name written all over it!!! 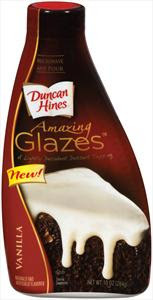 Duncan Hines is always a treat, and I would love to try the glazes. My family could use a sweet surprise! Because my husband loves Bisquick but it's too expensive for us. I'd love to win to try these new products out! Thanks! I would love this as a special treat for my family. I want to win these because I love to bake, but sometimes don't have all the ingredients around to bake from scratch. I would like to win this so I can make some delicious treats for my husband! I would like to win because I love chocolate and have to make dessert for my husbands office potluck lunch every week. I would like to win, I love their brownie mixes and their cakes mixes. I have never tried their glazes and think they would big a hit with family. I would like to win because I ran out of pancake mix this weekend! did you get your bracelet beck yet? Id like to win because I get a huge chocolate craving about once a month!! Because my mouth is now drooling and I really want to try these!!!! I would love to make this for my son and DIL. I would surpise my kids with them! I would like to win this so I can surprise my husband when he comes home from long work trips away! I would like to win because I love chocolate cake and I like using Duncan Hines mixes. I'd like to win these because they sound tasty! I'd love to win because I'm not much of a baker. I rely on boxes and bags and kits. And these sound fantastic! i would love to win because my husband's birthday is coming up and i would love to use the cake and glaze for his cake. I love trying new things and this just looks so good. I would like to win because I love Duncan Hines and I've never tried any of these before. 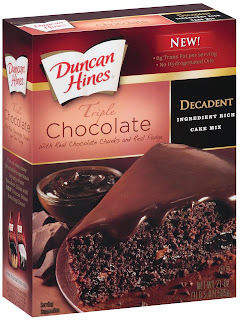 I love Duncan Hines and I love baking..would love to try these! I would like to win this because my husband loves good chocolate cake--and I can only bake from a mix. My mom's birthday is coming up, and she absolutelt adores chocolate!!!!! I'd love to surprise her with some sweet treats. The new mixes look yummy. I would like to give this to my neighbor! I'd love to win the chocolate cake mix because I love chocolate. This would be wonderful to serve at my little Halloween party. Sounds so good. I would like to try these items because I haven't yet! Thanks! I like chocolate-chocolate milk, chocolate candy, chocolate czke, chocolate pudding, etc. I would like to win this so that I can enjoy more chocolate. Also, some waffles would be good for breakfast. I would like to win becasue I love to bake and these sound delicious. These sound beyond amazing! My fathers birthday is coming up, and i'd love making him a delicious cake! I'd love to win because I love chocolate cake! I love, love, love cake, and I'm a chocoholic! This is combining two of my favorites! Can't ask for more! Great review of the product, by the way. I enjoyed reading it! it would be great for something fun to do with the kids on a sunday afternoon! We'd definitely use these really quick...they look super yummy! I would love to win these because I've seen them at the grocery store, but have yet to purchase them. I just met someone who said they didn't like chocolate. I thought everyone liked chocolate. I've never tried them before and love to bake!